It’s funny how unexpected events in life often come along that add motivation and encouragement when we need it most. 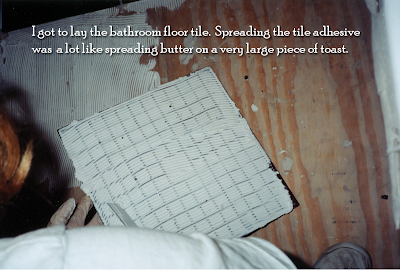 We discovered this phenomenon firsthand in mid-September 2000. We had been at work on the house for a month and half. My brother’s time helping us was drawing to a close, as he had university classes to go back to in mid-September. He left us with so much accomplished on the seemingly never-ending task list we had before us. Josh and my mom had tackled the major task of tiling the downstairs bathroom. 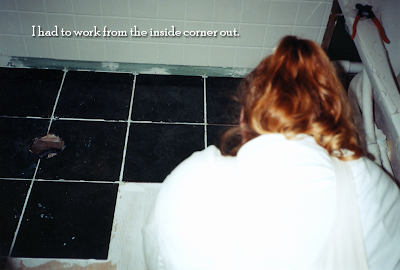 As a team, they cut and set white tile after white tile with beautiful, narrow, and clean grout lines in between. Josh and Mom were also able to grout most of the tile, leaving only the tile around the bottom edge of the tub for us to do. 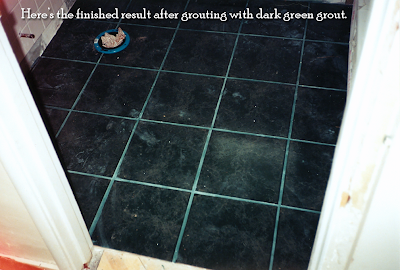 And it was left to us to lay the large ceramic bathroom floor tiles. 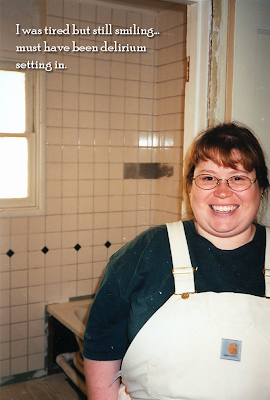 Working on the bathroom and kitchen simultaneously while trying to maneuver around the stacks of moving boxes staged in the living room and bedrooms wore on our nerves and frazzled our sense of accomplishment. 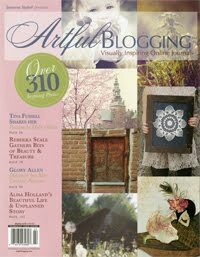 It seemed like we had been at this forever and would continue to be at it in perpetuity. It was hard to imagine a time when we could move out of the spare room at my sister’s house and really live in our own house. 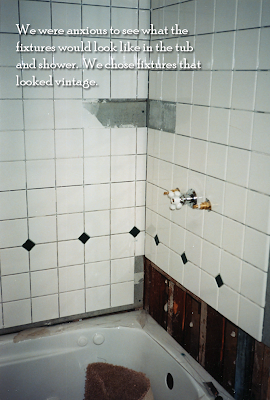 We had determined that as long as we had an operational shower downstairs and the toilet upstairs, we could move in. We didn’t need a kitchen sink. We didn’t need a downstairs bathroom sink. And we didn’t need a downstairs toilet. That shower was all we needed. 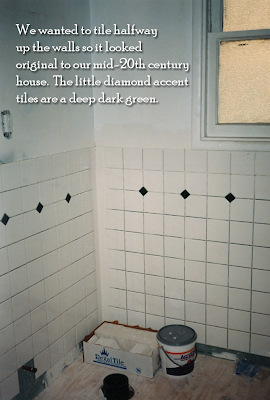 But the daunting task of getting it completed with the last tile and grout around the edge of the tub was so overwhelming that we avoided it. And our move-in date continued to be pushed out indefinitely. That’s when the unexpected life event came along to nudge us. In mid-September, we drove a half an hour east of our new home to attend a family gathering of Hubby’s relations as everyone came together to attend the baptisms of two cousins. We all converged at the ranch of the in-laws of my in-laws (Hubby says that makes them “outlaws”). I love visiting ranches, farms, or anywhere else that has animals. I tend to have social anxiety at parties and gatherings, so if there’s an animal around for me to focus on, I’m a happy camper. 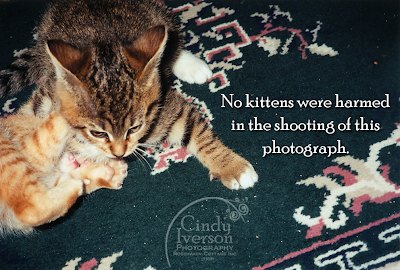 To my sheer delight, there was a litter of 10-day-old kittens on the back porch of the ranch house. All the young cousins gravitated toward the kittens, whose eyes were just beginning to open. Here were all these kids and me, cooing over the precious little balls of fur. 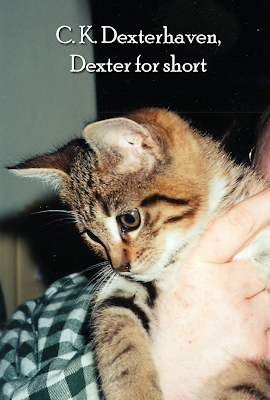 The mama cat, Skittles, was a blotchy tabby that had spots of red tabby and spots of regular tabby. 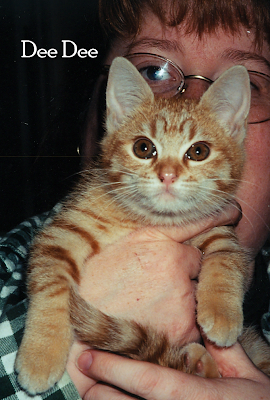 The sire of the 4 kittens was a handsome red striped tabby that lived at the ranch next door. Both parents were large cats with frames the size of small jungle cats. And Skittles was a hefty mama weighing in at close to 20 pounds. A couple of “kittens” from previous litters were still at the ranch, and it was evident that “big” was part of their genetics. 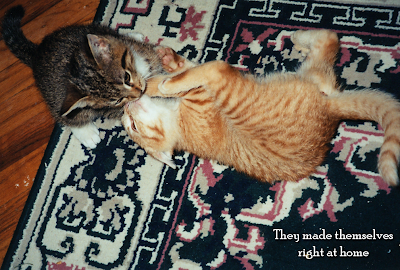 The newest kittens were all red tabbies except one—a little black striped tabby with white paws, a white bib, and a red tabby undercoat that made him look like a tiny tiger with his black stripes and ticking. I held him and snuggled him. He was precious. The kids at the ranch had handled the kittens since day one, and it was obvious that this little guy had been socialized well in his first 10 days. I called Hubby over to see this sweet little kitty that had already stolen my heart. Despite being allergic to cats, Hubby was smitten too. He didn’t have any allergic reaction to this little guy and before I knew it, we were making arrangements with the in-laws and reserving this little one as ours. We agreed that we would take him when he old enough to leave his mama at about 9-10 weeks old. And we agreed that we would be coming out every weekend to visit with our little one until we could bring him home. I decided to name our little kitty boy after one of my favorite movie characters, C.K. Dexterhaven, from The Philadelphia Story played by Cary Grant. We’d call him Dexter for short. This turn of events gave us the new impetus to get it in gear and get the shower done so we could move in and bring our little Dexter home. It gave us the hard deadline we had lacked up until that point. Over the next month, we made our weekly visits to the ranch to see our growing kitten and visit with his littermates. The kittens were probably only about 4 weeks old when we went out to visit them and another turn of events happened. As we sat on the back porch entertaining the kittens with dry leaves, one of the little red tabby kittens began to pay a great deal of attention to me. She came up to me where I was sitting on the porch step, and sat down right between my feet. Then, trying to be like a big kitty, she leaned into my ankle in a wobbly kitten-like way, looked up at me, and asked for affection. I brought her to Hubby’s attention. This little gal was very focused on us, as was her brother, Dexter. The other two kittens were more interested in playing with each other and roughhousing. I knew from past experience, that if you’re picking out a kitten from a litter you should always pick the kitten that is focused on you and not necessarily the kitten that has the color fur you’re looking for. During that visit, Hubby and I realized that we were going to become the proud owners of two kittens and not just one. We had to come up with a name for the little strawberry blonde sister we were claiming. We were fans of the Cartoon Network’s cartoon, "Dexter’s Laboratory". In the cartoon, a little boy named Dexter is a “mad scientist” of sorts and he always introduced his blonde tutu-wearing sister as his “stupid sister Dee Dee”. It seemed fitting to name our Dexter's sister Dee Dee--even though she was far from "stupid" as she had artfully charmed her way into our hearts and into our home. We had even more motivation to get the shower done and get moved into our house. We worked hard getting a downstairs room in shape to be our bedroom and getting the shower tile finalized and the floor tile laid so we could finally occupy our own home. The month of October was spent finalizing all the things that were on the “must have” list so we could move in and then bring our kittens home. I remember vividly the evening of Halloween, when the “cable lady” came and hooked up us up so we could have television reception. We accepted trick-or-treaters for the first time that night while I arranged furniture in the living room and moved boxes around so we’d have one room where we could relax and feel like we were "home". 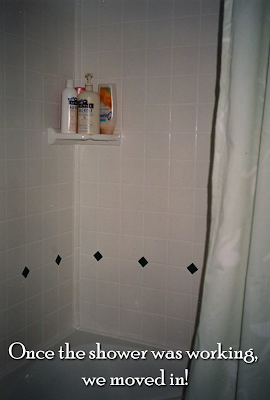 Over the following week, the final touches were put on the tub and shower. 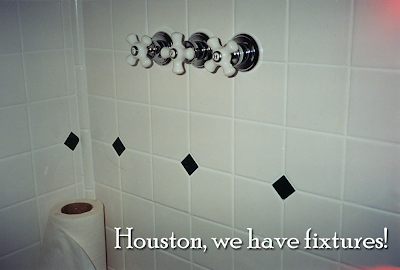 When the fixtures were finally installed in the tub and shower, we could finally move in, and on November 8, 2000 we officially started living in our house when we spent the night in our own bed. 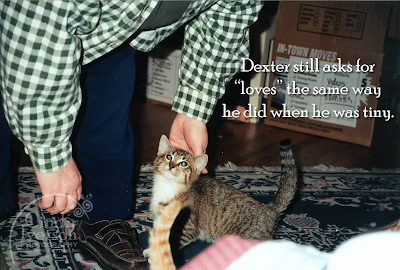 The next day, on November 9, 2000 we drove out to the ranch and brought Dexter and Dee Dee home. They made themselves right at home. Dexter eventually claimed me as his human. And Dee Dee claimed Hubby as her human with her beguiling little feline feminine wiles. Their presence amidst the continuing work has been the bright spot we have focused on through some difficult tasks and trials. 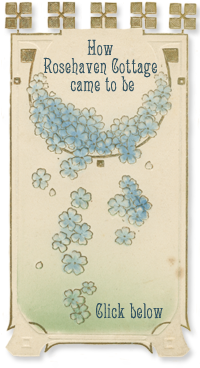 Their love and devotion has dried up many a tear and their antics have brought a smile to our face many times when nothing else could. 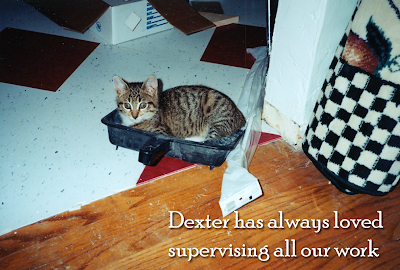 Since he was a wee thing, Dexter has monitored and supervised all the work that goes on around the house (including countless loads of laundry in our front loading washer). He will brave just about any power tool in order to remain in the room and supervise the changes we're making. When Hubby comes home from work, they both run to meet him at the door. And when visitors come to Rosehaven Cottage, they are the self-appointed host and hostess. They fulfil their duties well by greeting the guests as soon as they arrive and giving up their nap time to interact and socialize with everyone until the visit is over. Dexter and Dee Dee were definitely meant to live here at Rosehaven Cottage as much as we were. 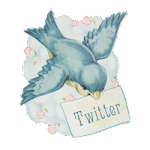 Hi Cindy, It was fun to see all your kitty pictures..... especially the one with Dexter supervising. They're pretty good at that, aren't they? I like your bathroom tiles! They are so cute! I'm a cat person too. We have two- Spicy and Biscuit. I'm so impressed with your tile work! We're at a standstill right now finishing the downstairs bathroom but should be moving forward soon. My big find is a pre-made granite countertop with undermounted sink for $250. Since my Dad is making the vanity, we'll just have it made to fit the bargain counter top. 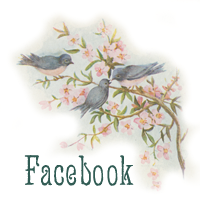 Sweet post about your darling kitties! I guess I didn't realize they were that old... almost 9! Don't we love our furry friends? Hi Cindy, what a wonderful story! It's so nice to know how you got both Dexter and DeeDee, and don't tell anybody but I often watch Dexter's Lab too. So the next time I watch it I sure will be thinking of you and your Dexter and DeeDee. BTW there's a kitty heavy post up at Bliss too. What stunningly beautiful kittens- no wonder you were smitten. I maintain that animals are Angels wrapped in fur. Those are the cutest little ambassadors. A house is not a home until it has an animal living in it. You guys did an amazing job in the bathroom. I love the vintage look. 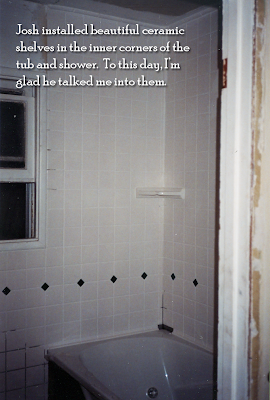 How thrilling it must have been to take your first shower in there. I always wonder how people come up with names for their animal companions. What an adorable kitty story! They grow up so fast, don't they? Spending time and money on something truly makes you appreciate and adore it more doesn't it? 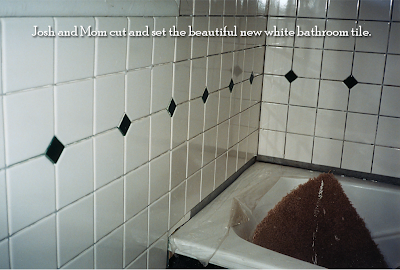 Glad you are telling the story of the transformation of you lovely home...hope I get to see it sometime soon! What a beautiful story! I never tire of hearing how people come to own their pets; cats, dogs, rabbits, horses, guinea pigs, fish...it doesn't matter to me, I love to hear about them all! Rani likes to supervise too. When I was painting my bedroom walls in the old house, Rani would sit underneath and watch the roller going up and down and it didn't matter to her that I moved her out of the way several times, she still came back and it didn't matter to her that she would end up splattered with tiny drops of paint! LOL! That was a wonderful story!! So sweet...I'm glad I popped by when I did!